Samsung, the world's second largest phone maker globally after Nokia, has announced Bada as its own new smartphone platform which it hopes to use to gain entry into the sophisticated phone market. Samsung's Bada, the Korean word for "ocean," is reportedly built on top of Linux and is expected to be released with an open SDK next month, with the first Bada phones to be introduced early next year. Unlike Symbian or Android, Samsung appears to be developing its new mobile platform and software market solely for the benefit of its own phones, much like RIM, Apple, and Palm. The company's current smartphone lineup is about 80% Windows Mobile and 20% Symbian. A year ago, the company released the new Windows Mobile Omnia as its flagship offering, but followed up this year with the Omnia HD using Symbian instead, a move identical to Sony Ericsson's release of the Windows Mobile Xperia X1 followed by this year's Symbian-based Idou. Also like Sony Ericsson, Samsung announced plans earlier this year to back Android instead of Symbian in the future, with an announcement that 30% of its phones next year would use Android. That expansion was expected to come from reduced use of Windows Mobile, but now Samsung is indicating that it will phase out Symbian entirely, drastically reduce the use of Windows Mobile, and introduce the new Bada as its preferred smartphone operating system. 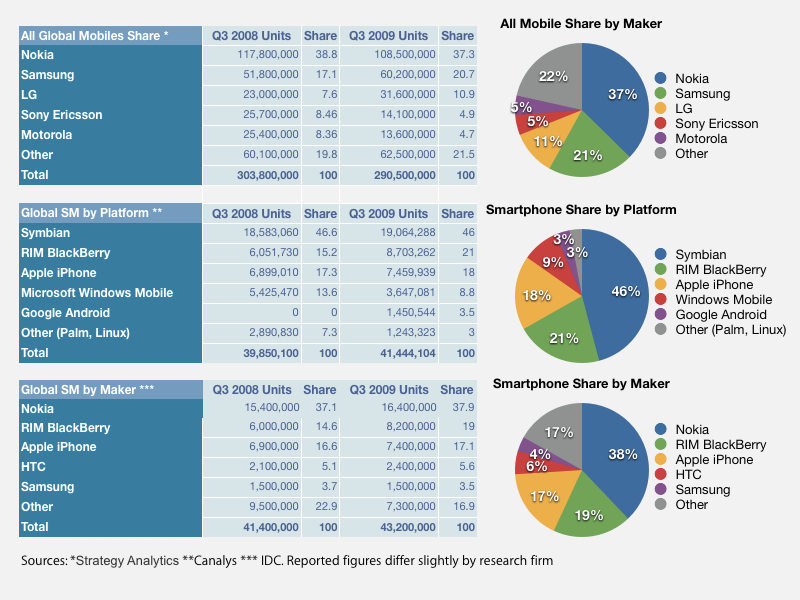 HMC investment securities analyst Greg Noh outlined Samsung's expected smartphone mix showing Symbian completely phased out by 2011, and Samsung's own Bada making up half of its portfolio by 2012, with the remainder being about 30% Android and 20% Windows Mobile. In the general mobile phone market, Samsung has been making incremental progress toward leader Nokia with around 20% of the global phone market. It currently sells more phones than the rest of the top five makers (LG, Sony Ericsson and Motorola) combined. In smartphones however, Samsung has just recently broke into the top five vendors, well behind Nokia, RIM, Apple, and HTC with sales of just 1.4 million in the most recent quarter, the same figure as last year. With the growth in smartphones, that contributed to Samsung's market share of advanced phones actually slipping slightly year over year. Android advocates widely expected Samsung to warmly adopt Google's platform, as it provides a free alternative to the Windows Mobile software the company currently uses. Instead, Samsung is following Nokia's lead in working to maintain its own destiny independent of Google. Nokia is both sponsoring the Symbian Foundation and its own Maemo Linux distribution. Samsung's interest in creating and managing its own smartphone platform also reflects the interests of second place smartphone vendor RIM and its BlackBerry OS, and Apple in third place with the iPhone. Palm has followed a similar strategy with its own proprietary WebOS. As a smartphone vendor experienced with using third party software from Microsoft and Symbian, Samsung's interest in developing and maintaining its own proprietary platform rather than trying to adapt Android to create differentiated phones in a competitive market is a dramatic refutal of the conventional thinking that Android will explode among vendors next year. Instead, Samsung's considerable resources will be devoted toward its own new platform, creating more competition and differentiation in options among smartphone platforms and reducing the energy being channeled toward licensed operating systems, with Windows Mobile being the biggest loser (with the loss of around 1.2 million of the 3.6 million Windows Mobile phones that shipped in Q3 2009), Symbian losing a significant licensee entirely, and Android facing a rival new marketplace for mobile software. Samsung expects to release more information to developers about its SDK plans next month via its Bada website.